Given the amount of angst over male pattern balding, surprisingly little is known about its cause at the cellular level. In a new study, published in the Journal of Clinical Investigation, a team led by George Cotsarelis, MD, chair of the Department of Dermatology at the University of Pennsylvania School of Medicine, has found that stem cells play an unexpected role in explaining what happens in bald scalp. Using cell samples from men undergoing hair transplants, the team compared follicles from bald scalp and non-bald scalp, and found that bald areas had the same number of stem cells as normal scalp in the same person. However, they did find that another, more mature cell type called a progenitor cell was markedly depleted in the follicles of bald scalp. The researchers surmised that balding may arise from a problem with stem-cell activation rather than the numbers of stem cells in follicles. In male pattern balding, hair follicles actually shrink; they don't disappear. The hairs are essentially microscopic on the bald part of the scalp compared to other spots. "We asked: 'Are stem cells depleted in bald scalp?'" says Cotsarelis. "We were surprised to find the number of stem cells was the same in the bald part of the scalp compared with other places, but did find a difference in the abundance of a specific type of cell, thought to be a progenitor cell," he says. "This implies that there is a problem in the activation of stem cells converting to progenitor cells in bald scalp." At this point, the researchers don't know why there is a breakdown in this conversion. "However, the fact that there are normal numbers of stem cells in bald scalp gives us hope for reactivating those stem cells," notes Cotsarelis. In 2007, the Cotsarelis lab found that hair follicles in adult mice regenerate by re-awakening genes once active only in developing embryos. The team determined that wound healing in a mouse model created an "embryonic window" of opportunity to manipulate the number of new hair follicles that form. By activating dormant embryonic molecular pathways stem cells were coaxed into forming new hair follicles. In the JCI study, the group also found a progenitor cell population in mice that is analogous to the human cells; these cells were able to make hair follicles and grow hair when injected into an immunodeficient mice. 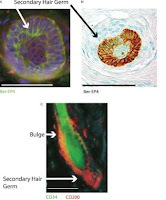 The researchers say their next steps will be to study the stem and progenitor populations in other types of hair loss, including female pattern hair loss. 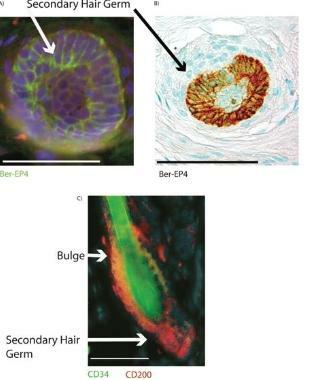 The information may assist in developing cell-based treatments for male pattern balding by isolating stem cells and expanding them to add back to the scalp directly. They will also focus on identifying factors that could be used topically to convert stem cells to progenitor cells to generate normal large hairs. Researchers have found what appears to be a critical tuning dial for controlling whole body energy, according to a new report in the January issue of Cell Metabolism, a Cell Press publication. When energy levels within cells drop, it sets off a series of events designed to increase the amount of calorie-rich dietary fat that the body will absorb. This energy reset mechanism is surely critical for survival under natural conditions of scarcity to ensure a steady supply of fuel, the researchers say. Today, many of us who enjoy a Western diet loaded with fat might do better if we could find a way to turn the activity of the so-called AMPK-SRC-2 pathway down. "Thousands of years ago, this would have been crucial," said Bert O'Malley of Baylor College of Medicine. "Now it's trouble because we eat so much fatty food." 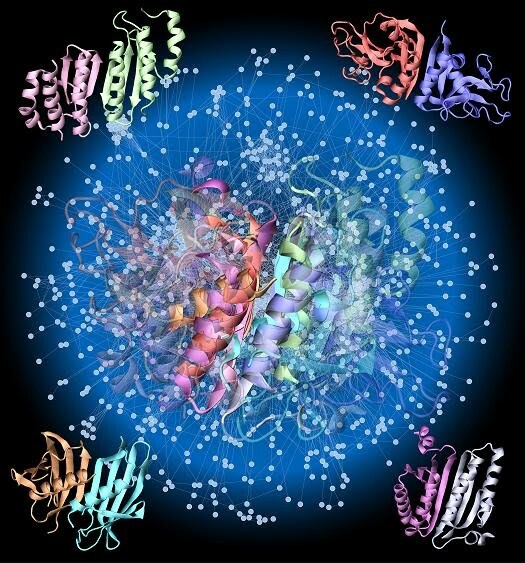 Earlier studies had shown the enzyme AMPK to be an ancient energy sensor. The enzyme causes cells to consume less energy in the form of ATP and to produce more. AMPK also drives appetite. The new work shows that AMPK also allows for the optimal absorption of the most energy-rich fuel from the diet: fat. That effect of AMPK depends on its activation of SRC-2, a master control gene whose job is to switch other genes on. When SRC-2 springs into action, it controls genes that lead to the secretion of bile from the gall bladder into the intestine. "You need bile to emulsify and absorb fat," O'Malley explained. Mice lacking SRC-2 fail to absorb fat normally, they report. Those deficiencies can be corrected by restoring bile acids to the gut. Together with earlier work, the findings present a "pretty picture" in which SRC-2 is involved in absorbing and storing fat. SRC-2 is also known to play a role in releasing stored glucose from the liver. "It's all about energy accretion, storage and delivery," O'Malley says. This process takes place on a daily basis even when there is already plenty of fat stored in the body. "It's designed to get in more fat," he says. "Over evolutionary time, when you didn't know when the next meal would be, you really couldn't get enough fat. Now, our next meal is at the corner McDonald's." The discovery reveals a key mechanism linking the cellular energy state with the whole-body energy state and may ultimately have important clinical implications, the researchers say. "Obesity is all about fat absorption and storage," O'Malley said. "If you could turn that down, you could have a major effect on a disease that is slowly killing the population." He says his team is now conducting studies in search of SRC-2 inhibitors that might do exactly that. The epic ocean-spanning journeys of the gigantic leatherback turtle in the South Atlantic have been revealed for the first time thanks to groundbreaking research using satellite tracking. Experts at the Centre for Ecology and Conservation (Cornwall) at the University of Exeter led a five-year study to find out more about these increasingly rare creatures and inform conservation efforts. The research, published in the Proceedings of the Royal Society B [5th January 2011], has shed new light on the little-known migration behaviour of these animals – following their movement from the world's largest breeding colony in Gabon, Central Africa, as they returned to feeding grounds across the South Atlantic. Out of 25 females studied in the new research, three migratory routes were identified – including one 7,563km (4,699 mile) journey straight across the South Atlantic from Africa to South America. Other routes still involved large distances, as they moved from Gabon to food-rich habitats in the southwest and southeast Atlantic and off the coast of Central Africa. They will stay in these areas for 2-5 years to build up the reserves to reproduce, when they will return to Gabon once again. Dr Matthew Witt said: "Despite extensive research carried out on leatherbacks, no-one has really been sure about the journeys they take in the South Atlantic until now. What we've shown is that there are three clear migration routes as they head back to feeding grounds after breeding in Gabon, although the numbers adopting each strategy varied each year. We don't know what influences that choice yet, but we do know these are truly remarkable journeys – with one female tracked for thousands of miles travelling in a straight line right across the Atlantic." In the Pacific ocean, leatherback turtles have seen a precipitous decline over the past three decades – with one nesting colony in Mexico declining from 70,000 in 1982 to just 250 by 1998-9*. The exact cause of the dramatic fall-off in numbers is not clear, but turtle egg harvesting, coastal gillnet fishing, and longline fishing have been identified as potential factors. In the Atlantic, population levels have been more robust but, due to variations in numbers at nesting sites each year, it's not clear whether they are in decline. Conservationists are keen to take action now to avoid a repeat of the Pacific story. Dr Brendan Godley said the new research would be vital for informing this conservation strategy: "All of the routes we've identified take the leatherbacks through areas of high risk from fisheries, so there's a very real danger to the Atlantic population. Knowing the routes has also helped us identify at least 11 nations who should be involved in conservation efforts, as well as those with long-distance fishing fleets. There's a concern that the turtles we tracked spent a long time on the High Seas, where it's very difficult to implement and manage conservation efforts, but hopefully this research will help inform future efforts to safeguard these fantastic creatures." 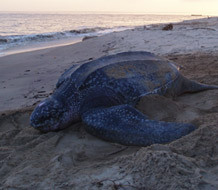 Dr. Howard Rosenbaum, Director of the Wildlife Conservation Society's Ocean Giants Program, said: "This important work shows that protecting leatherback turtles—the ancient mariners of our oceans—requires research and conservation on important nesting beaches, foraging areas and important areas of the high seas. Armed with a better understanding of migration patterns and preferences for particular areas of the ocean, the conservation community can now work toward protecting leatherbacks at sea, which has been previously difficult." BBSRC-funded scientists have discovered how a network of repair proteins enables bacteria to prioritise the repair of the most heavily used regions of the DNA molecules that carry the instructions necessary for living cells to function. The work, published in the latest edition of Molecular Cell, provides new information and research tools to support future technological and medical advances that will be underpinned by our knowledge of DNA repair and antibiotic resistance. The research also reveals that there are greater similarities between the DNA repair systems of bacteria and humans than had been suspected. When the chemical "letters" in a cell's DNA book of instructions are damaged the instructions become difficult to read and the cell may not function properly. For example, exposure to too much sunshine increases the risk of skin cancer because the ultraviolet light present in sunshine damages the DNA in skin cells and can cause them to grow in an abnormal way. The repair systems need molecular machines that can detect the DNA damage in the first place, machines that can cut away the damaged DNA, and machines that can finish the repair by building new undamaged DNA. All of these molecular machines must work together in an organised fashion to carry out these very intricate repairs, and so they also require machines that take the part of foreman and co-ordinate the work of the others. When DNA is heavily damaged, cells from humans to bacteria ensure the sections that are being read at that moment (in a process called transcription) are repaired before sections that aren't being read. A team led by Dr. Nigel Savery from the DNA-Protein interactions Unit in the University of Bristol's School of Biochemistry has purified each of the many individual components of this "transcription-coupled" DNA repair pathway from the bacterium Escherichia coli and rebuilt the system in a test-tube. This allowed them to investigate the effects of disabling different parts of the different machines and hence to work out what is required to prioritise certain sections of DNA for repair. The team found that different proteins take responsibility for spotting damage in different situations, and explained how one of the central machines is able to turn itself off when it is not working, in order to decrease the "fuel consumption" of the system. Dr Savery said: "This work is an example of "basic research", it is a fundamental study of the molecular mechanisms of an important biological function that is conserved from bacteria to man, and was begun in a spirit of scientific exploration rather than with a view to an immediate technological or medical application. However, like all basic research it provides the foundation of knowledge upon which technological and medical advances are built. In this case the work provides knowledge and experimental tools that may help to explain how this transcription-coupled DNA repair pathway, which normally prevents mutation, acts to increase the frequency with which antibiotic-resistant mutants of bacteria involved in food poisoning arise." If you owned a mechanical device made out of the strongest material known to mankind, wouldn’t you want to know under what circumstances it might fail? 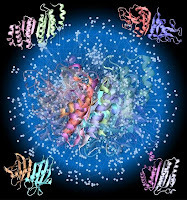 Interactions between proteins are at the heart of cellular processes, and those interactions depend on the interfaces where the direct physical contact occurs. A new study published recently suggests that there may be roughly a thousand structurally-distinct protein-protein interfaces -- and that their structures depend largely on the simple physics of the proteins. Physicists at Ohio State University have discovered that tiny defects inside a computer chip can be used to tune the properties of key atoms in the chip. 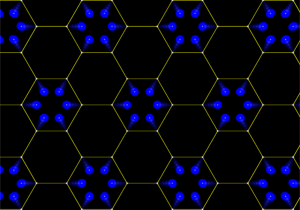 The technique, which they describe in the journal Science, involves rearranging the holes left by missing atoms to tune the properties of dopants – the chemical impurities that give the semiconductors in computer chips their special properties. Though the technique is currently limited to the laboratory, it could prove valuable to industry in the future, as the continued miniaturization of cell phone and computer chips makes the performance of individual atoms in a semiconductor more important. The initial discovery happened in the summer of 2008 as then-graduate student Donghun Lee was carefully measuring how the properties of dopant atoms depended on the arrangement of other nearby atoms. Lee and Gupta were peering at the common chip material gallium arsenide using a scanning tunneling microscope (STM), a type of electron microscope that can image surfaces with atomic resolution and position single atoms using a strong electric field. Researchers commonly nudge atoms with an STM’s electric field to rearrange them. In the case of these chip materials, the rearrangement process was like playing a sliding tile puzzle, Gupta explained; they rearranged the vacancies – empty holes, considered defects – in the material. For example, they found that an arsenic vacancy on the surface of the material – like the missing tile in a puzzle – could be effectively moved by nudging an arsenic atom into a different nearby hole, thus resulting in a new hole where the arsenic atom used to be. The hole left by the arsenic atom has its own electric field, and the researchers studied the influence of this field on nearby dopants – in this case, manganese atoms. They noticed that the dopant’s energy level dropped when the hole was moved nearby, and increased when it was moved away. Dopants are important in semiconductor devices such as computer chips because they enable very sensitive control over the current flow, depending on temperature and applied voltage. The dopant’s energy is the key parameter that determines this ability. 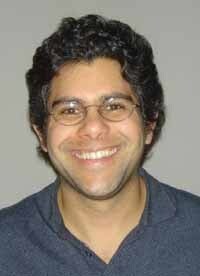 Following the initial discovery, Gupta says it took over a year of additional experiments to understand the effect. While chip makers aren’t likely to employ STMs in their production lines anytime soon, Gupta believes that they could take advantage of the discovery in a practical way – by manipulating tiny electric fields across the metal electrodes that already exist on top of chips. Manufacturers may be interested in this technique for not only improving current chip technologies in the short term, but also for developing new chip designs in the long term. Today, a single chip may contain only a few dozen dopant atoms that are critical to its performance. As chips get smaller, the performance of every atom will count even more, and techniques such as Gupta’s that can control individual dopant atoms could become very important. In the future, a computer’s logic controls and memory could both be integrated on a single chip, if semiconductor materials could be made magnetic at room temperature and above; those technologies are still under development. Computers powered by such chips would theoretically use less power, and never need rebooting. Manganese-doped gallium arsenide is a prototypical magnetic semiconductor, which is why Gupta and Lee are now exploring how they might control the magnetic interaction between two or more manganese atoms using their discovery. In an ideal world, political boundaries would enclose groups of people who are connected to each other more than they are connected to outsiders. A new study using a computer algorithm developed at Cornell shows that Great Britain is -- almost -- already organized that way. 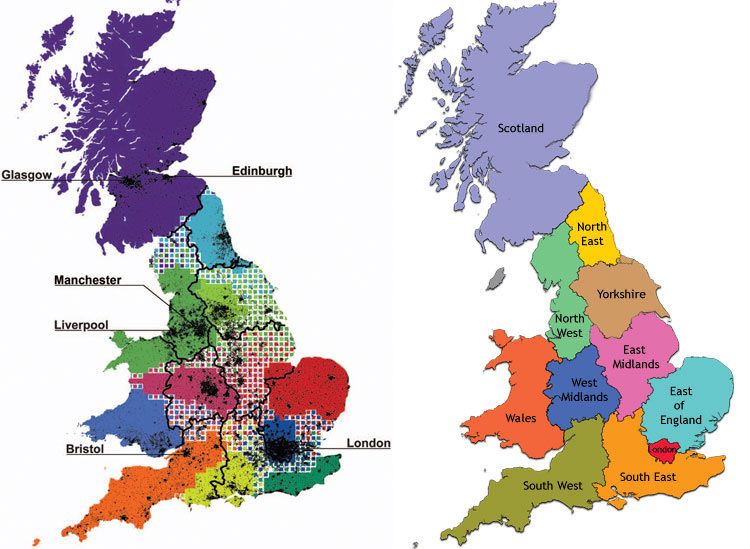 Analyzing a database of British telephone calls, which they call "the largest non-Internet human network," researchers at Cornell, the Massachusetts Institute of Technology and in the United Kingdom found that connections coincided remarkably well with administrative boundaries. One surprise was that people in Wales communicate with people beyond their border more than expected. A non-surprise was that Scotland keeps pretty much to itself. "A community is something where most of the links are inside the community instead of outside," explained Steven Strogatz, the Jacob Gould Schurman Professor of Applied Mathematics, who advised the researchers on how to analyze the data using an algorithm, or computer method, designed to show how a network breaks down into subsections. The algorithm was developed by former Cornell researchers Michelle Girvan, now a University of Maryland physics professor, and Mark Newman, now a University of Michigan physics professor. The research is reported in the Dec. 8 issue of the online journal PLoS ONE. The Cornell algorithm is described in the Proceedings of the National Academy of Sciences 103: 89577-8582 (2006). "This could be especially useful in regions where there are disputes over where the borders should be. A lot of big databases could be mined to find where people are in terms of human interaction," Strogatz said. "We're not making any claim about what we should do politically; it's to demonstrate the capability." The methods, he noted, are an extension of classic social science studies of organizations, where researchers observed "who spends time with whom." What's new here is the addition of a geographic overlay, Strogatz said. The researchers worked with an anonymized database of 12 billion calls over a one-month period, from which they extracted 20.8 million nodes and 85.8 million links between them. They divided the map of the island into 3,042 pixels, each 9.5 kilometers square, and measured the strength of connections -- defined as total call time -- between nodes in each pixel and those in every other pixel. The computer then tested groupings among pixels until it found an arrangement that showed the most links within communities and the fewest between them. The result coincided nicely with existing boundaries of administrative regions. Communities and political boundaries probably evolved together over many centuries, the researchers suggested, with "cohesive patterns within society promoting change in administrative boundaries and the latter, in turn, affecting human interaction." One departure from the pattern was that people in eastern Wales communicated extensively with those around nearby cities in the adjacent region of West Midlands. On the other hand, only 23 percent of calls made inside Scotland were to other parts of Britain. "The effects of a possible secession of Wales from Great Britain would be twice as disruptive as that of Scotland," the researchers said. The study also found a new "region" west of London, around a growing center of high-tech industry -- the British version of Silicon Valley. The methods used in this research could also be used with cell phone records, which would measure more personal as opposed to business communication, or with credit card transactions or personal travel patterns, the researchers said. "All together, these approaches could lead to a new perspective in regional studies, transportation planning and economic geography," they concluded. Contrary to the popular belief of many scientists and members of the public, new research confirms that Africa has two – not one – species of elephant. Scientists from Harvard University, the University of Illinois, and the University of York in the United Kingdom used detailed genetic analysis to prove that the African savanna elephant and the smaller African forest elephant have been distinct species for several million years. The researchers, whose findings appear online in PLoS Biology, intended to investigate the genetic relationship between the extinct woolly mammoth and mastodon to modern elephants. Not only is this the first time that anyone has generated sequences for the mastodon nuclear genome, but it is also the first time that the Asian elephant, African forest elephant, African savanna elephant, the extinct woolly mammoth, and the extinct American mastodon have been looked at together. "Experimentally, we had a major challenge to extract DNA sequences from two fossils, mammoths and mastodons, and line them up with DNA from modern elephants over hundreds of sections of the genome," said researcher Nadin Rohland of the Department of Genetics at Harvard University. David Reich, associate professor in the Department of Genetics at Harvard Medical School, said their results were unexpected. "The surprising finding from our study is that forest and savanna elephants from Africa – which some have argued are the same species – are as distinct from each other as Asian elephants and mammoths." Professor Michi Hofreiter, who specialises in the study of ancient DNA in the Department of Biology at York, said, "The divergence of the two species took place around the time of the divergence of Asian elephant and woolly mammoths. The split between African savanna and forest elephants is almost as old as the split between humans and chimpanzees. This result amazed us all. "The possibility that the two might be separate species was first raised in 2001, but this is the most compelling scientific evidence so far that they are indeed different species." 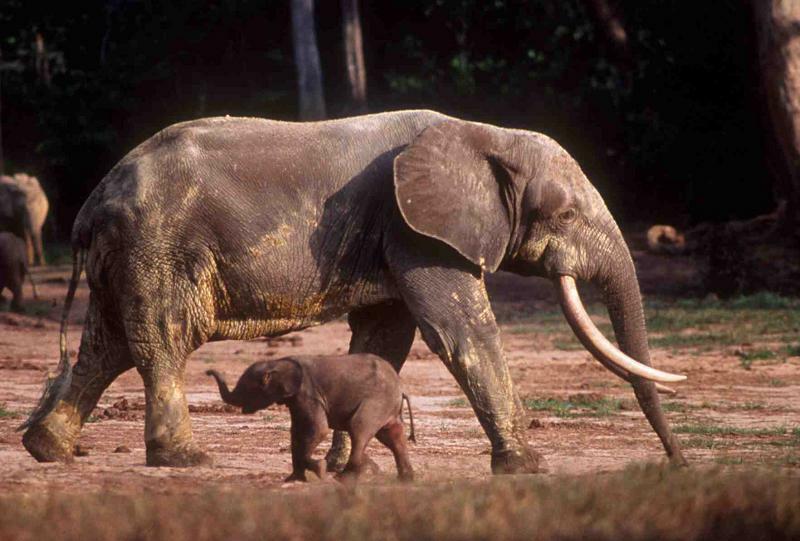 Previously, many naturalists believed that African savanna elephants and African forest elephants were two populations of the same species, despite the elephants’ significant size differences. The savanna elephant has an average shoulder height of 3.5 metres while the forest elephant has an average shoulder height of 2.5 metres. The savanna elephant weighs between six and seven tonnes, roughly double the weight of the forest elephant. DNA analysis revealed a wide range of genetic diversity within each species. The savanna elephant and woolly mammoth have very low genetic diversity, Asian elephants have medium diversity, and forest elephants have very high diversity. Researchers believe this is due to varying levels of reproductive competition among males. Alfred Roca, assistant professor in the Department of Animal Sciences at the University of Illinois, said, "We now have to treat the forest and savanna elephants as two different units for conservation purposes. Since 1950, all African elephants have been conserved as one species. Now that we know the forest and savanna elephants are two very distinctive animals, the forest elephant should become a bigger priority for conservation purposes." The hair color of an unknown perpetrator who has committed a crime will soon no longer be a secret for forensic investigators. Erasmus MC scientists, in collaboration with their Polish colleagues, have discovered that DNA can be used to predict people’s probable hair color. Their findings were published in the Springer journal Human Genetics. The research findings demonstrate that on the basis of DNA information it is possible to determine with an accuracy of more than 90 percent whether a person has red hair, with a similarly high accuracy whether a person has black hair, and with an accuracy of more than 80 percent whether a person’s hair color is blond or brown. This new DNA approach even allows differentiating hair colors that are similar, for example, between red and reddish blond, or between blond and dark blond hair. The necessary DNA can be taken from blood, sperm, saliva or other biological materials relevant in forensic case work. The current study was directed at the predictability of the color of the hair on the head. Further research would be necessary to predict the color of body hair. Everyone has heard that carbon dioxide is responsible for global warming. But the gas also has some positive characteristics. Researchers are now impregnating plastics with compressed CO2 in a process that could lead to new applications ranging from colored contact lenses to bacteria-resistant door handles. CO2 is more than just a waste product. In fact, it has a variety of uses: the chemical industry makes use of this colorless gas to produce urea, methanol and salicylic acid. Urea is a fertilizer, methanol is a fuel additive, and salicylic acid is an ingredient in aspirin. 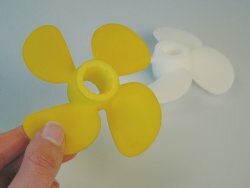 Researchers at the Fraunhofer Institute for Environmental, Safety and Energy Technology UMSICHT in Oberhausen are pursuing a new idea by testing how carbon dioxide can be used to impregnate plastics. At a temperature of 30.1 degrees Celsius and a pressure of 73.8 bar, CO2 goes into a supercritical state that gives the gas solvent-like properties. In this state, it can be introduced into polymers, or act as a “carrier” in which dyes, additives, medical compounds and other substances can be dissolved. “We pump liquid carbon dioxide into a high-pressure container with the plastic components that are to be impregnated, then steadily increase the temperature and the pressure until the gas reaches the supercritical state. When that state is reached, we increase the pressure further. At 170 bar, pigment in powder form dissolves completely in the CO2 and then diffuses with the gas into the plastic. The whole process only takes a few minutes. When the container is opened, the gas escapes through the surface of the polymer but the pigment stays behind and cannot subsequently be wiped off,” explains Dipl.-Ing. Manfred Renner, a scientist at Fraunhofer UMSICHT. The process holds enormous potential, as carbon dioxide is non-flammable, non-toxic and inexpensive. Whilst it shows solvent-like properties, it does not have the same harmful effects on health and on the environment as the solvents that are used in paints, for example. Painted surfaces are also easily damaged and are not scratch-resistant. Conventional processes for impregnating plastics and giving them new functions have numerous drawbacks. Injection molding, for instance, does not permit the introduction of heat-sensitive substances such as fire retardants or UV stabilizers. Many dyes change color; purple turns black. “Our method allows us to customize high-value plastic components and lifestyle products such as mobile phone shells. The best about it is that the color, additive or active ingredient is introduced into layers near the surface at temperatures far below the material’s melting point, in an environ mentally friendly manner that does away with the need for aggressive solvents,” says Renner. The process could, for example, be used to dye contact lenses – and lenses could even be enriched with pharmaceutical compounds that would then be slowly released to the eye throughout the day, representing an alternative to repeated applications of eye drops for the treatment of glaucoma. According to the scientist, this new impregnation method is suitable for a broad range of new applications. 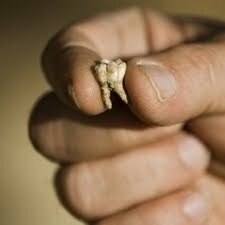 It has long been believed that modern man emerged from the continent of Africa 200,000 years ago. Now Tel Aviv University archaeologists have uncovered evidence that Homo sapiens roamed the land now called Israel as early as 400,000 years ago — the earliest evidence for the existence of modern man anywhere in the world. Prof. Gopher and Dr. Barkai noted that the findings related to the culture of those who dwelled in the Qesem Cave — including the systematic production of flint blades; the regular use of fire; evidence of hunting, cutting and sharing of animal meat; mining raw materials to produce flint tools from subsurface sources — reinforce the hypothesis that this was, in fact, innovative and pioneering behavior that may correspond with the appearance of modern man. Excavations at Qesem Cave continue and the researchers hope to uncover additional finds that will enable them to confirm the findings published up to now and to enhance our understanding of the evolution of mankind — especially the emergence of modern man.